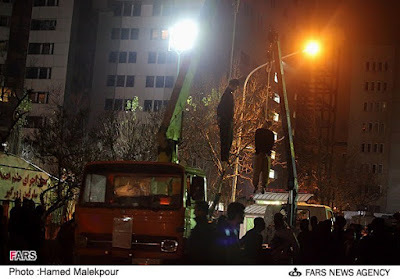 Iran has hanged a man (not this picture) who was accused of committing murder in California. A human rights organization claimed on Tuesday that an Iranian-American man had been hanged by the Islamic regime for committing murder in California. “According to confirmed sources, Iranian authorities carried out the death sentence for Hamid Samiee and another prisoner at Karaj’s Rajai Shahr Prison on Wednesday November 4,” Iran Human Rights, a nonprofit organization that claims to have sources within Iran, disclosed on Tuesday. “Confirmed sources say Samiee was arrested in 2008 after the murder victim’s family had reported him to Iranian authorities,” according to Iran Human Rights. Samiee and Janmohammadi were reportedly friends living in Californian until an altercation took place between them, according sources who spoke to the human rights organization. A State Department official told the Free Beacon Tuesday afternoon that Samiei is a dual citizen and that it is looking into the reports on his hanging. The State Department has been aware of Samei’s plight since late October, the source said. The Iranians often leave the State Department in the dark when it detains dual nations, the source said. And we're going to trust this 'justice' system with nukes?